Happy New Year! I hope that 2017 is off to a great start for you all. So far we have been enjoying getting back to a “normal” schedule, whatever that is, and cleaning and sorting the house from top to bottom. We’ve been donating things left and right in order to simplify our life and home. That is my goal for the year. To simplify. To not get caught up with buying things that we don’t truly need, to avoid bringing extra clutter to our home, and to minimize the distractions that pull my attention from what matters most to me…my family. One of the highlights of our holiday season was having fun roasting our own coffee beans at home. It was such a great project that Michael and I enjoyed doing together. We made batch after batch, testing and re-testing, and loving every moment of it. Not to mention every whiff of the glorious aroma that filled our house! I’m only allowed very limited amounts of caffeine due to baby, so Hubby took one for the team and did the majority of the tasting. I sipped each roast, but he definitely got to enjoy the full experience. His words: “Best cup of coffee I’ve ever had.” That’s saying a lot. He’s a big fan of coffee, and we’ve lived in Italy, so his palate has seen a huge variety. I was so excited that he loved it! 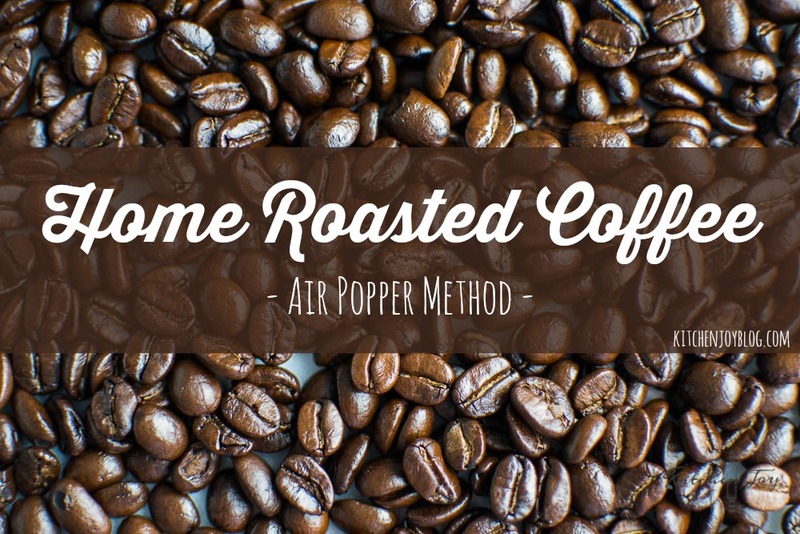 Home roasted coffee beans are actually very simple to make. There are a lot of methods and tutorials available online. We did a lot of research, but we found that it worked best when we didn’t overthink it too much. As far as equipment, nothing fancy is needed. An air popcorn popper, a large bowl, a metal colander, and some green (unroasted) coffee beans are all you need to get started. All are readily available for purchase online. Ventilated area. For best results, roast your coffee in the kitchen with a window slightly open, the vent fan running, or even just do it outside. It is the bitter cold of winter here right now, so we found our results were much easier to replicate when we roasted indoors. The process does involve a bit of smoke, so be prepared for the smoke alarm to sound if you’re nearby one. We had the kitchen door open slightly after a few batches, but the smoke really wasn’t a large amount. Cold colander. As you can imagine, the roasted coffee beans are VERY hot when you take them out of the roaster. Because they retain so much heat, they will continue to roast a bit until they cool down. For this reason, it is important to cool the beans as quickly as possible. We found that it works really well to keep the metal colander in the freezer in between each batch so that we can pour the piping hot beans into the cold colander to speed up the cooling process, and carried it straight outside into the cool air and shook the colander gently to toss the beans around until they were cool enough to touch. Use a timer. 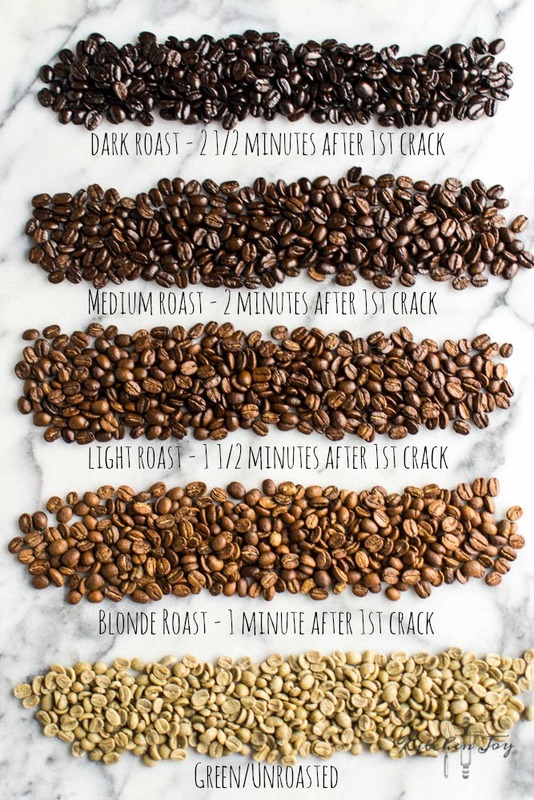 Until you get a lot of practice and are able to identify the roast you desire just by appearance, aroma, etc.., I recommend using a timer so you know about when the roasting time is done, then you can stop the roasting a bit earlier or later based on your observations. Watching and listening carefully. Once you start the beans roasting, the main task is to listen for the first ‘crack’. It takes a few minutes for this to happen, but be sure to pay attention for it. You’ll hear a very pronounced cracking noise. More of a cracking sound than a popping one. We found that it worked well to start timing from the first crack. As soon as we heard the crack, we started a timer. The beans will crack again after a few minutes of roasting, which is known as the second crack. Coffee is considered drinkable when roasted anywhere between those two cracks. Just before your desired roast is reached, turn off the popper and pour beans into cold colander. They will continue to roast until they cool down a bit. Allow time for off-gassing. Once the beans are roasted, they will give off gases for a period of time. During this time, it is important to leave them in an open container to allow the gases to escape, a minimum of 4 hours, up to 24 hours before sealing them in a container or grinding the beans for brewing. Embrace the mess. Roasting coffee at home isn’t all that messy, but what mess there is you just need to live with until you’re done roasting. Cleanup is really easy. Preventing the mess in the first place is not. Green coffee beans have a chaff on them, which is basically a skin that will come off during roasting. The air popcorn popper will blow out the chaff as the beans are roasting. You can catch most of the chaff with a large bowl. Be careful not to surround the popper too closely with any type of container though, as it can inhibit the air intake to the popper, which can cause it to get too hot. We tried a few different methods to contain the mess, but all resulted in more trouble than they were worth, and they didn’t allow adequate air circulation during roasting. Angle of the popcorn popper. We found that tilting the popper at about a 45° angle helped to prevent any coffee beans from flying out, only allowing the chaff to come out of the chute. You could prop the base up on something, or just hold the popper in the correct position (the sides of the popcorn popper don’t get too hot to handle). Above all, have fun and find what techniques and roasts suit your preferences. Just because we like things one way, doesn’t mean everyone will.
. They are great quality, single origin from Nicaragua. They’re direct trade, and produce a beautifully smooth cup of coffee. Believe me, they’re great. If you don’t believe me, read the Amazon reviews. Gather all supplies in a well-ventilated area. Measure green coffee beans according to the popcorn popper manufacturer’s instructions, usually ½ cup. (Do not add more than directed. Too many beans can cause air blockage and doesn’t allow proper heat circulation.) Add beans to popper reservoir. Place a large bowl near the chute to catch the chaff, or place popper next to a sink. Turn on the popper, tilting the chute upward at about a 45° angle to prevent beans from flying out of the chute. Unplug popper when desired roast is nearly reached. Carefully pour coffee beans into chilled colander and toss beans around in colander until cool enough to touch. Pour cooled beans into a bowl and leave uncovered for 4-24 hours to allow for off-gassing. 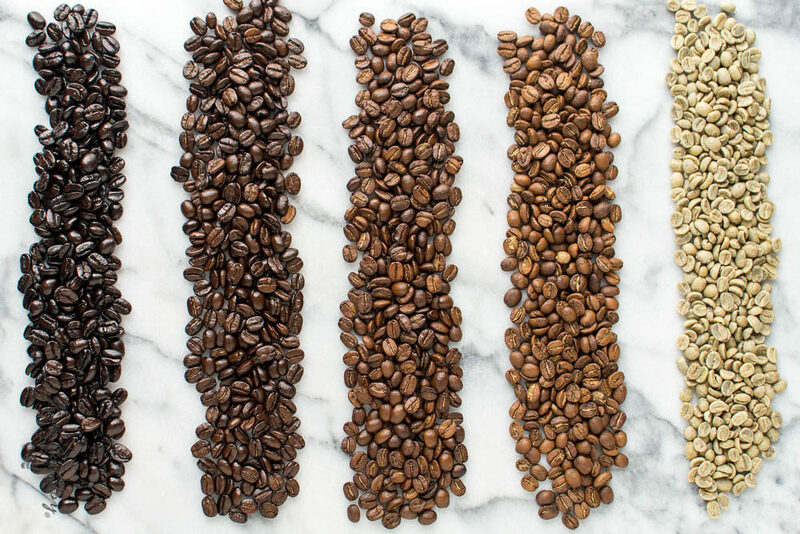 Grind, brew, and enjoy every sip of your home-roasted coffee! Gather all supplies in a well-ventilated area. Measure green coffee beans according to the popcorn popper manufacturer’s instructions, usually ½ cup. Add beans to popper reservoir. Place a large bowl near the chute to catch the chaff, or place popper next to a sink. Thanks for visiting! Please accept my apologies if you’ve had trouble accessing my site over the last week or two. We’ve had some major technical difficulties, but things are working better now and I’m working on switching to a new hosting provider to hopefully prevent a repeat of this recent disaster. Thank you so much for visiting my site. Sending blessings for a wonderful 2017!